impossible to go farther than this. It is seen that the curve is periodic, which would indicate that each one of the sodium lines is a double line. 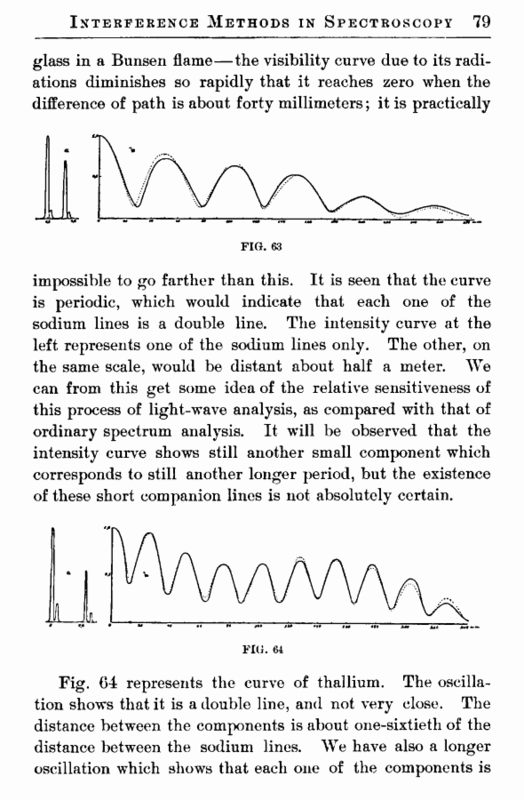 The intensity curve at the left represents one of the sodium lines only. The other, on the same scale, would be distant about half a meter. We can from this get some idea of the relative sensitiveness of this process of light-wave analysis, as compared with that of ordinary spectrum analysis. It will be observed that the intensity curve shows still another small component which corresponds to still another longer period, but the existence of these short companion lines is not absolutely certain. double. The distance between these small components and the larger ones is something like one-thousandth of the distance between sodium lines, corresponding to a separation of lines far beyond the possible limit of the most powerful spectroscope. looks almost as though it were the exceptional result of this particular series of measurements, and we might imagine that another series of measurements would give quite a different curve. 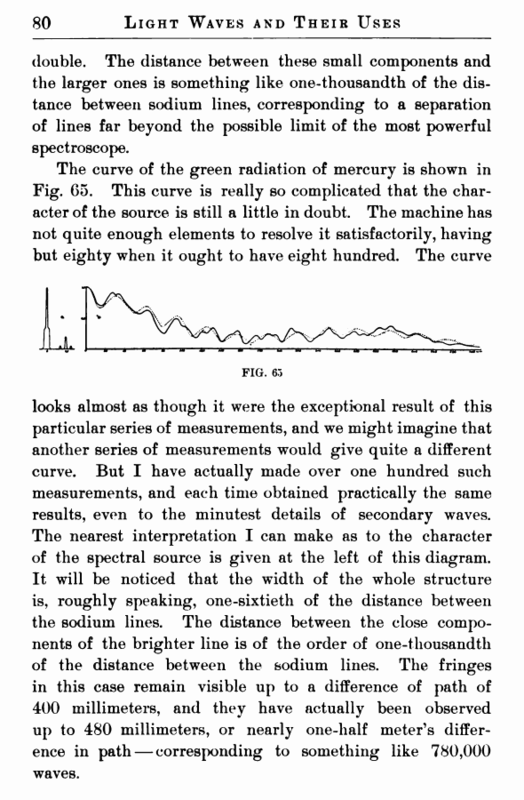 But I have actually made over one hundred such measurements, and each time obtained practically the same results, even to the minutest details of secondary waves. The nearest interpretation I can make as to the character of the spectral source is given at the left of this diagram. It will be noticed that the width of the whole structure is, roughly speaking, one-sixtieth of the distance between the sodium lines. The distance between the close components of the brighter line is of the order of one-thousandth of the distance between the sodium lines. The fringes in this case remain visible up to a difference of path of 400 millimeters, and they have actually been observed up to 480 millimeters, or nearly one-half meter’s difference in path — corresponding to something like 780,000 waves.